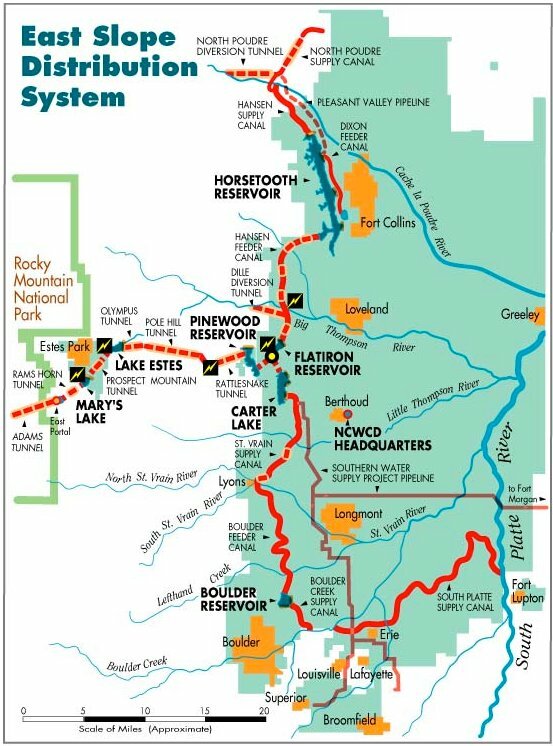 Starting Oct. 27, officials from the Bureau of Reclamation turned off the water diversion tunnel from the West Slope to the Colorado-Big Thompson Project that feeds many of the lakes and reservoirs in Larimer County. The reservoir levels have also been lowered through the release of water to storage downstream. According to a news release from the agency, the shutdown has allowed for the inspection of dams at Marys Lake and Lake Estes near Estes Park, and Flatiron Reservoir west of Loveland. While the reservoirs are at low levels, crews are also looking at the power generation facilities at the Marys and Pole Hill power plants and the Charles Hansen Feeder Canal. According to agency officials, the work will continue on the reservoirs and facilities throughout November, with water diversions through the Adams Tunnel from the Western Slope slated to resume in mid-December.